Mediterranean food has often good LCHF food options and so does my local Turkish restaurant Clicia in Stoke Newington, North London. Here I’ve discovered some of my absolute low-carb high-fat favourites. 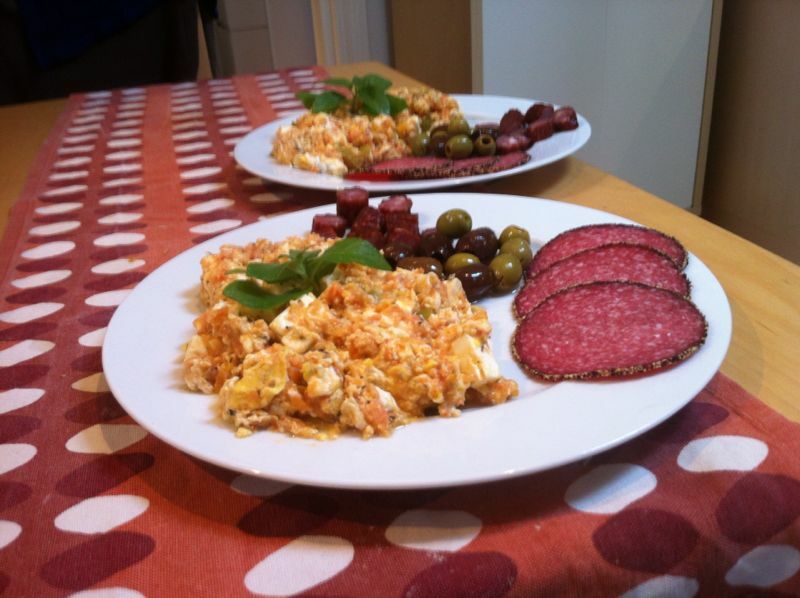 One favourite is the still, I suppose you can say, rather liquid utterly delicious Turkish scrambled eggs, called Menemen. This is traditionally served with bread at the side but I chose to do without bread. With some Turkish advice how to do Menemen, the original way I decided to give it a try myself. Apart from below ingredients you can mix and match as you like with e.g. Turkish spicy sausage and baby spinach. Warm up a frying pan and pour in the olive oil to heat up. Add chopped long green peppers and finely chopped onions and cook until peppers and onion start softening (about 3 min). Stir frequently to prevent burning. Sir in the grated, juicy tomatoes on top of the other ingredients and let simmer for about 5 min, or until most of the moisture evaporates. However, do not allow the tomatoes to dry out completely – you want some of that tomato moisture in your menemen. Eventually crack and fold in eggs and finally Feta cheese. Season to taste with salt and pepper. Stir gently now and then to fasten the cooking: the menemen will be done in 2 minutes. You don’t want to overcook it to get dry crumbles. Garnish with fresh mint leaves and serve with your choice of olives, tasty sausage and salami. I haven’t eaten at Clicia for years – have fond memories of their food, glad to hear it’s still good and of course, your breakfast looks lovely too!